When we are in a new place and looking for something to eat, I'm notorious with my wife for questing to find that spot that just feels right. Sometimes the quest is difficult and fraught with tired feet and growling bellies. Other times everything rolls easy. This was one of those easy-rolling times. We had passed Cocteles Vallarta the day before while wandering along Avenida del Pacifico, and had noted that it looked nice and relaxed. We saw some gentlemen sitting in the corner seats with their view over the beach and I thought - those guys have the best seats in the house. 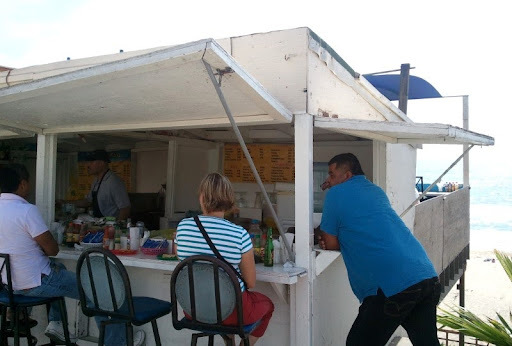 We spent several fantastic hours eating seafood, sometimes watching the scene at the beach and, more often than not, watching the chef of the mariscos stand do his thing. It was a lot like watching a really good bartender go about his business. But while a refreshing drink was easily obtained, the business here was not drinks, but fresh seafood. 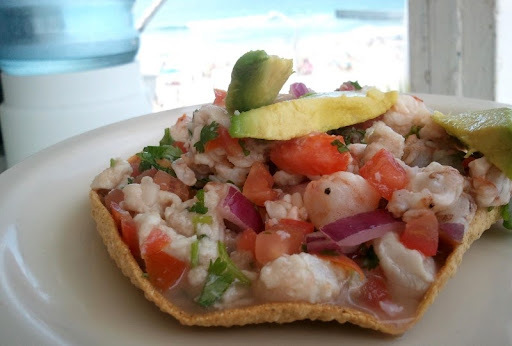 We started with a tostada mixta - a tostada of mixed seafood. This was definitely up there with the best I've ever had. Super fresh tasting, with lots of citrus. Really good. 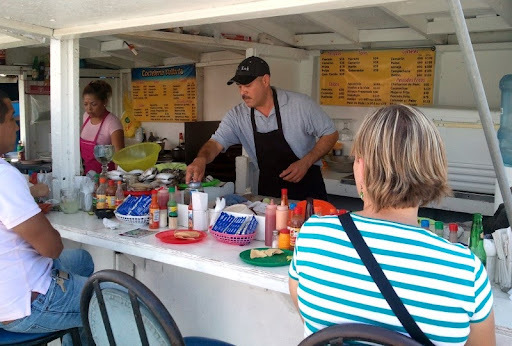 We followed that with some tacos - fish and shrimp. Both were lightly battered and fried - in what I think of as "Ensenada-style". They were great - we hoovered them up before I thought to take a picture. Satiated for the moment, we sipped on our beers and enjoyed watching a host of orders being prepared for a happy and easy-going group of costumers - ceviches, plates of fried fish and shrimp, and substantive seafood cocktails (made with a fresh base, not the thickly sweet ketchupy stuff I don't like). We watched them be shucked, sliced and made into cocktails. They were also being made into a some sort of preparation in a bowl. 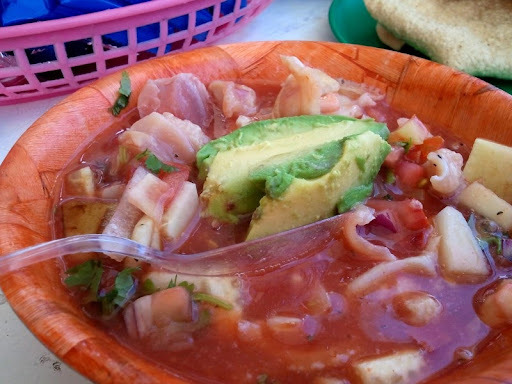 We had been thinking about having another tostada mixta, but my eyes went from the bowl to "almeja preparada" (prepared clam) on the menu and we decided on that instead. This was perhaps the single best thing we had on our visit to Playas. 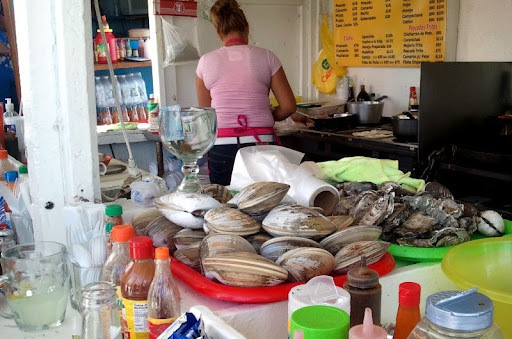 Fresh clam meat, elaborated much like a cerveza preparada - with lime juice, onion, cilanro, clamato, hot sauce and a hit of maggi. Much like making a bloody mary. The result was perfect - bright, tangy, savory and altogether very pleasant to eat. Even amidst all of of the other strong flavors, the clam maintained a definite taste of its own. And its texture was great and varied - with some bits more firm and others softer. Eating at Cocteles Vallarta was a great experience, and one I just can't imagine having north of the border. We hope to be back soon. Aw man... now I'm hungry!